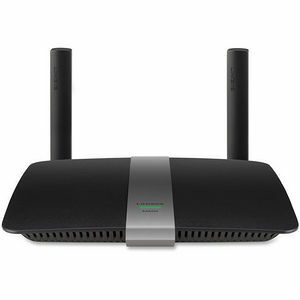 Wireless router features dual wireless bands (2.4 GHz and 5 GHz) with data speeds up to N300 Mbps plus AC867 Mbps to handle your media-intense applications such as video streaming, online gaming and more. Next-generation, Wireless-AC standard outperforms Wireless-N with speeds nearly three times faster. Gigabit Ethernet ports transfer data 10 times faster than Fast Ethernet to provide a high-speed connection for your wired devices. Beamforming technology focuses the Wi-Fi signal directly to your devices instead of sending out a general transmission to help eliminate dead spots. Plus, two external antennas help strengthen the signal for a more efficient network with a wider range. USB 3.0 port lets you share files and add external storage across your network. Smart Wi-Fi allows you to monitor and control your home network from anywhere through the website or mobile app. Advanced wireless security protects your network with wireless WPA/WPA2 encryption and an SPI firewall.